The memory of airman Jesse Herman Brewer, who took part in a crucial operation in World War II, will be immortalised at the Lascaris war rooms. The air medal he received after completing several successful missions and the letters sent to his parents during his time as a pilot in 1943 have been donated to the Fondazzjoni Wirt Artna. 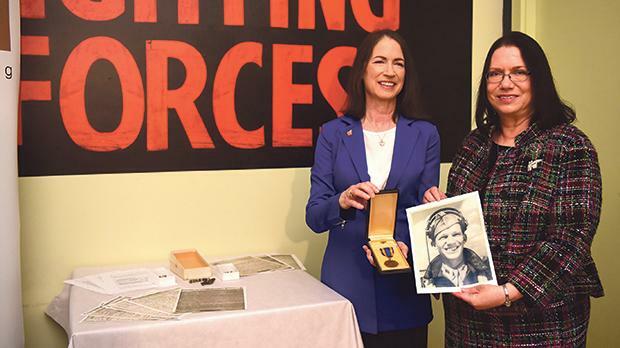 Mr Brewer’s two daughters, Carla Brewer and Lisa Stapp, believe that the war rooms were the right place to honour his efforts in World War II. “My husband and I visited Malta in April, discovered the Lascaris war rooms and realised our father’s artefacts were much better served here rather than in our drawer for no one to ever see,” Ms Stapp said. Their father had served in a key operation, codenamed Operation Husky, the invasion of Sicily. The operation was a major campaign in World War II, as the Allies captured Sicily from the Axis powers. The Lascaris war rooms had a major say in the operation. Overall command of Operation Husky was in the hands of General Dwight Eisenhower. The operation, which took more than 30 days, started when the British army landed in the vicinity of Syracuse and the Americans in the Gulf of Gela. After six days of fighting, the Allies captured the lower half of Sicily as well as the airfields in that part of the island. The operation had a critical role in World War II, Fondazzjoni Wirt Artna head Mario Farrugia said. Thus, the donation by Mr Brewer’s daughters was very much appreciated, he added. The donation also helped Fondazzjoni Wirt Artna learn more about the pilots’ experience during the war. “The Americans were not as censored as the British people were and they were allowed to divulge more information in their letters,” Mr Farrugia noted. Mr Brewer did not speak much about the war when he returned home. However, Ms Brewer remembers vividly how one key feature of the experience stood out at the time. “He said it was very quiet when he was flying. He had been used to seeing war films, where there would be music while people were flying their planes,” Ms Brewer said. “I remember him saying how surprised he was there was no music,” she added. Mr Brewer died in 2000, at the age of 81, after becoming a respected medical doctor in his hometown in Texas.